My older brothers both love to cook, love trying new recipes, and we regularly have text or email exchanges about something we ate or tasted that was so amazing it must be recreated RIGHT NOW IF NOT SOONER! I have spent many happy hours puttering in the kitchen with one (or both) of them. A few weeks ago I spent a wonderful few days in my brother’s kitchen, this sweet cornbread was the result. My people, it is AMAZINGLY delicious. 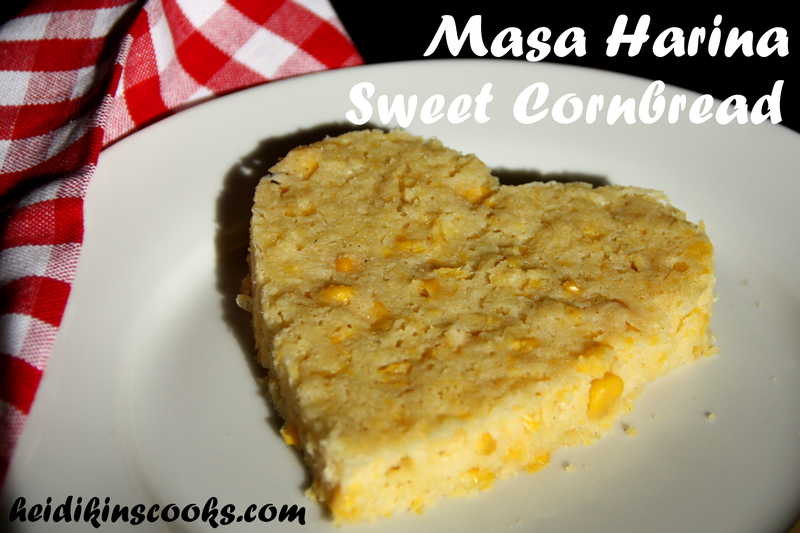 The recipe calls for corn kernels, cornmeal, and masa harina, a corn flour. Mix that up with some butter, sugar, and cream and you have really got something! I have made this twice in the last 10 days and have eaten it for breakfast, as a snack, as a side to soup or chili, and as a dessert with a little dollop of thick whipped cream. And for those who care, it is completely gluten free. So, get thee to the grocery for a bag of masa harina and get cooking! Preheat oven to 350. In medium bowl (or stand mixer) beat butter until it is creamy. Add masa harina and water and beat until well mixed. Using food processor or blender, process thawed corn until chopped but still chunky. Add to butter-masa harina mixture. Sift cornmeal, sugar, salt, and baking powder. Add to corn mixture and stir to combine. Add cream and stir to incorporate. Pour batter into an ungreased 8×8 baking pan, smooth with spoon or spatula and cover with foil. Bake 50-60 minutes. Allow to cool for 10 minutes and serve while still warm. You can cut this into squares or scoop out with a large spoon. If you let it cool you can use a cookie cutter to make fun shapes, like this photo. Warning, this is MUCH better warm than cold, so if you go the fun shapes route, pop it into the microwave for 30-40 seconds before eating to get everything warm and delicious again. *Masa harina is corn flour, it is a finer powder than cornmeal, and can usually be found in the baking aisle of your grocery store. Look by the flour or the cornmeal.